First, full disclosure: Kevin Hassett, the chair of Trump’s CEA, is an old friend, a good dude, and a guy I’m happy to see in this prominent post. But even as I endorsed him for the job, I publically worried about one area of his research where his claims go way beyond the evidence and ignore the counter-evidence. That area is the impact of tax cuts on growth, jobs, and particularly wages and incomes. Thus, CEA’s new report on the wage-boosting effects of the proposed cut in the corporate rate from 35 to 20 percent looks fatally flawed to me. It is a literature review that picks only the ripest of cherries, ignoring the large body of literature that goes hard in the other direction. A particularly notable example of this problem is a citation of one study by tax analyst Jane Gravelle (et al) that CEA uses to support their thumb-on-the-scale results, while ignoring another Gravelle (et al) study that directly debunks CEAs main thesis that corporate rate reductions boost workers wages. Cross-country studies to provide direct evidence showing that the burden of the corporate tax actually falls on labor yield unreasonable results and prove to suffer from econometric flaws that also lead to a disappearance of the results when corrected, in those cases where data were obtained and the results replicated. In every case, the coefficient estimates are close to zero and are not statistically significant at conventional confidence levels. In using annual data, we can find no evidence that changes in the top corporate tax rate affects wage rates in manufacturing. This is also why you want to heavily discount CEA’s Figure 1, which compares wage growth across very different countries with no controls (I’m not moved by Latvia’s faster wage growth and lower corporate rate). CBPPs Huang and DeBot go through these issues in readable detail here. –The analysis assumes average impacts are similar to median ones. 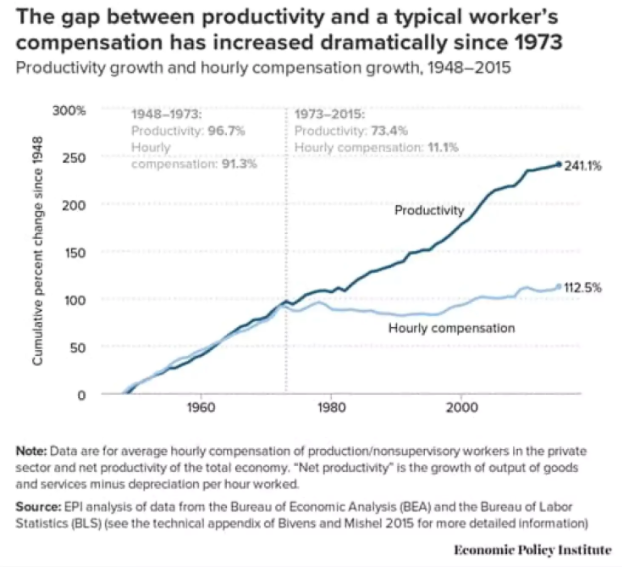 This is a very big deal, because, as I argue here, even if the trickle-down chain they tout is operative (and the empirical data suggests it is not), there’s still a big slip twixt cup and lip in the last step: the idea that faster productivity growth lifts median, vs. average, compensation. I wish it were so, but as per the figure below, it is not. Essentially, CEA assumes away wage inequality. –To CEA’s credit, though they argue that the proposal, including the shift to a territorial system that exempts foreign earnings by US companies from US taxation, reduces profit shifting (booking profits in places with lower rates), they don’t directly add that effect to wages. –They do, however, suggest this effect would be “additive” to workers’ incomes. This suggests that CEA is conflating tax avoidance with actual job and wage creating economic activity, as Howard Gleckman points out here. –This one’s important too: CEA ignores the “excess profits” problem. That is, while economists argue about who benefits from a reduction in the corporate tax, we agree that it purely benefits firms with profits beyond normal returns on investment. So, for big firms that dominate in their industries–Apple, Alphabet/Google, Amazon, etc.–the corporate cut clearly boosts profits far more than wages. –CEA is clear that their analysis only covers the corporate part of the tax change, and that’s reasonable. 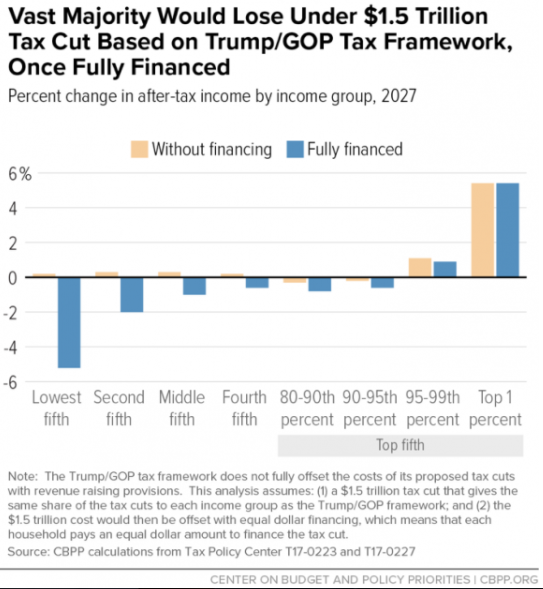 Except for when we’re talking about distributional results, we must consider the impact of the tax cuts as we understand them in their entirety. Otherwise, we risk overlooking aspects that hurt middle and low-income households. We at CBPP have stressed these impacts, particularly the losses at the low end if the tax cuts are eventually paid for by spending cuts (see figure below). Gussy it up any way you want, this is just the latest example of non-credible, trickle-down fairy dust. Corporate tax cuts will merely boost the profits of a sector that’s already highly profitable at the expense of the working class. Given its trillions in retained earnings and low capital costs, the corporate sector could already raise investments and worker pay if it wanted to do so. Thanks again, Donald and co.
Share the post "I got issues with the new CEA report"
11 comments in reply to "I got issues with the new CEA report"
The end of your analysis is indistinguishable in theory from people saying the Obama stimulus won’t stimulate because it will eventually be paid for in taxes. Your saying the tax cuts won’t stimulate because they will be paid for in spending cuts. This ignores your own argument that the tax cuts will mostly be just financed by a larger deficit, or that deficit spending in an under utilized economy won’t be inflationary and will propel growth. Now it won’t be efficient since it accrues to the very rich who already have too much money so it ends up creating asset bubbles. A small part will trickle down, perhaps just enough to carry Trump to victory in 2020. The bar has been set so low, it would be hard not to beat the record of Bush who brought us two failed wars and the biggest downturn since the Great Depression, or Obama who failed to sustain his legacy, in all three branches of government, and left median income $851 dollars above the Bush peak in 2007 and $335 dollars above the Clinton peak in 1999. Not a lot to show for 8 eight years, and they are still working on tearing down more of what’s left. I think it depends on who’s taxes you cut and who’s taxes are used to pay back the deficit/debt. If you cut taxes/give credits to the bottom 80th percentile and then pay for that with taxes from the 1 percent I think that would be a very good, long-lasting stimulus to the economy. The blog doesn’t address that at all, giving a discount, or mutiplier depending on who is taxed and who gets cuts. But even if it did, it would still be applying the same principal conservatives used to say stimulus spending and tax cuts will not work. It’s hypocritical to argue different sides depending on who is cutting whom. It doesn’t matter which is more efficient, or which is more desirable. That is a separate argument. I guess I disagree. I believe it is critical to identify who is getting the tax cut or credit. Isn’t that how we shape public policy based on who needs help and who doesn’t? There is plenty evidence that cutting the taxes at the top severely impoverishes social programs at the bottom. We only have to look at Kansas over the last few years to see how cutting taxes of the rich and corporations and trying to balance the budget caused widespread immiseration for regular working folk. You have your logic reversed because the post above is claiming that people in lower incomes will anticipate future tax hikes or benefit cuts and so reduce their present spending. That is the same argument conservatives used against the Obama stimulus and Keynesian spending, and in applying Bernstein’s point about anticipated actions to offset a deficit, it wouldn’t matter at all who got the lion’s share of the tax cuts, or benefited from extra spending. To be sure there will be a drag on the economy if cuts eventually come from benefit cuts the Democrats can’t block instead of the more probable deficit spending. But that is not the issue, the issue is the immediate impact based on people anticipating later measures, a classic conservative argument to which Bernstein inexplicably here lends support. You shouldn’t throw away a principle just because you don’t like the use to which it’s put. Has a high end tax cut EVER, ANYWHERE, EVER resulted in higher wages on this planet? I don’t remember one in my lifetime or my parents’ lifetime or my grandparents’ lifetime. Should I be reading the classics? This might have happened in ancient Greece or something. Didn’t happen in ancient Greece, either, but you should still read the classics! There is another component that is worthy of being mentioned: the top five percentile, and definitely the top percentile, have means of funneling their gains to off-shore locations, whereas the bottom half can barely afford to get by, let alone book a trip offshore. So, how does the country benefit? You endorsed Hassett because he’s an old friend/good dude? I have to assume so because you mention only that and not any of his economic forecasting successes. And you were mute about his recent TPC speech. I guess the old adage, “it’s not what you know, it’s who you know” is in play here. Friendship and good-dudeness override the “trickle-down fairy dust” stuff.